The Campaign Monitor Email Builder has been updated and now fully supports Gmail. This includes the Gmail and Yahoo! Mail apps on Android and iOS. 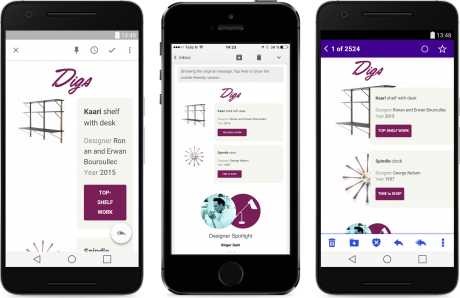 In the announcement, Campaign Monitor explains that its Email Builder has been supporting proper responsive email templates, which in turn make emails look good on mobile. However, for this to really work, email clients need to support so-called media queries. But here’s the thing: Gmail email clients don’t. An email with media queries opened in Gmail won’t show as intended, sadly. The need to pinch & zoom. We’ve all been there. The simple act of reading an email becomes a challenge, and we often give up and delete the email altogether. Needless to say, that’s not what you have in mind when you send an email campaign! Buttons are too small. Buttons become nearly useless – so those valuable CTAs you’ve created are never seen or clicked on. Text lines are too short. Reading lines of just one or two words each gets tiring very quickly. Some subscribers might hang in there – but others will give up. Multi-columns don’t render properly. Content shrunk down to fit a third of the mobile screen width, sometimes even with a different column width ratio than the original design. This impacts both the hierarchy and aesthetics of your presentation. Photos & images shrink. Because the whole email shrinks down, so does any beautiful photography or rich imagery making your beautiful email not so beautiful anymore. Campaign Monitor has solved this by optimizing emails for desktop second, after the mobile first approach. This means people who have a screen size (window) big enough to show the desktop styles. What this all boils down to is a better experience for the recipient, which is all that matters in the end. Kudos for getting this done in their email templates in the Campaign Monitor Email Builder. A behind the scens technical article on this called ‘Coding mobile-first’ emails can be found on Medium.